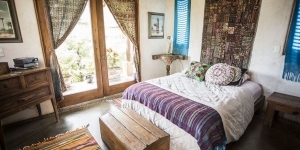 Energy work, Bodywork and Guided Adventure Tours are also available. 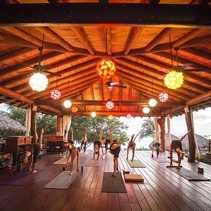 Our signature Yoga classes are offered twice daily in our tranquil Yoga Pavilion. 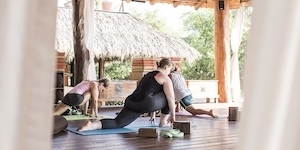 Present Moment instructors will guide you through a series of breathing techniques (pranayama) and gentle stretching and bending postures (asanas), all performed slowly and consciously with a focus on your inner awareness. As part of our Yoga and meditation classes, Pranayama is loosely translated as prana or breath control. The ancient yogis developed many breathing tecniques to maximize the benefits of prana (life force). Begin your day with our meditation class, as the Pacific Ocean provides the soothing soundtrack. The human body has an instinctive ability to shift into profound rest states in order to heal, energize, integrate, tune up and assimilate learning. Mediation promotes a heightened awareness of the details of everyday life. 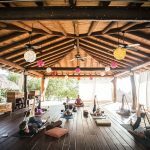 Present Moment Retreat, in partnership with SchoolYoga Institute, offers Yoga Teacher Training Programs that provide everything you need in philosophy, anatomy, chanting, business, wisdom, sutras, kriyas, meditation, pranayama, adjustment, art of teaching, shamanism and more.